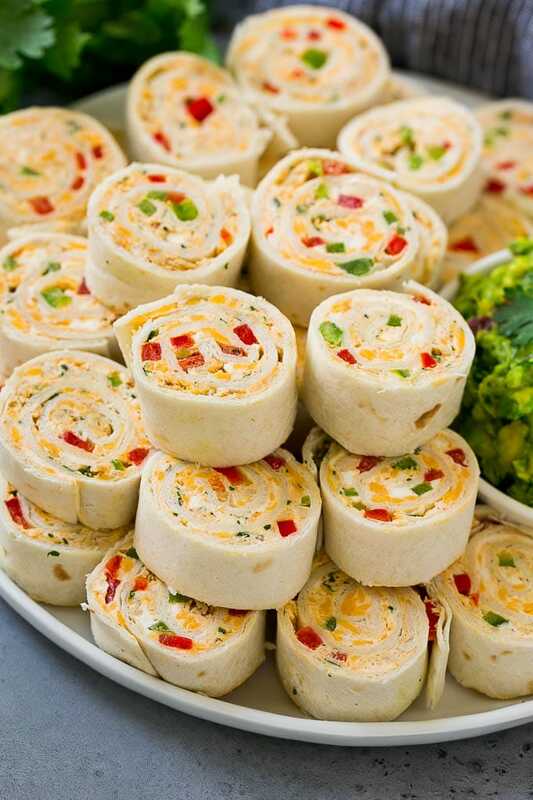 These taco pinwheels are made with chicken, taco seasoning, cream cheese and peppers, all rolled up inside tortillas. An easy make-ahead party appetizer! Pinwheel sandwiches are the ultimate light lunch or snack. These chicken pinwheels are made with Mexican flavors and always get rave reviews. I love having little snacks I can grab in the middle of the day that aren’t chips or something sweet. 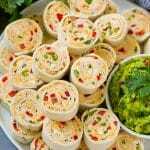 These taco pinwheels always hit the spot and are definitely a much healthier option than the aforementioned snacks. Not to mention, they’re a great make-ahead appetizer! HOW DO YOU MAKE TACO PINWHEELS? For these chicken pinwheels, start by adding your cream cheese, cheddar cheese, and taco seasoning to a bowl and mix to combine. Add the rest of your ingredients (except the tortillas) to the bowl and mix again. 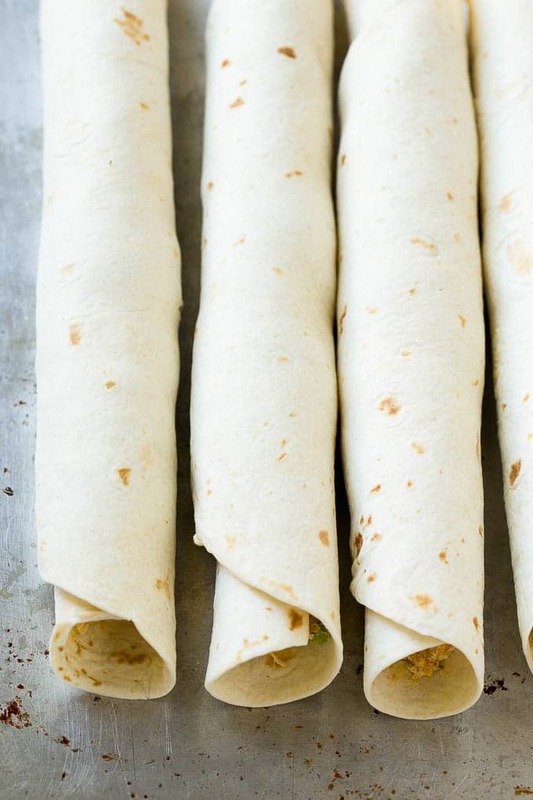 Lay out your first tortilla and fill the middle with some of that delicious southwestern filling, then roll it up tightly and place it in the fridge. Repeat until you’ve used everything up, then slice and enjoy! These Mexican pinwheels are great for making the day before a get together. Just simply roll them up, cover with plastic wrap, and let them sit in the fridge until the next day. When you’re ready to serve them, just pull them from the fridge and slice them up. Any cooked chicken will work for this recipe. Leftover chicken or rotisserie chicken are two of my favorite choices when it comes to these chicken pinwheels. 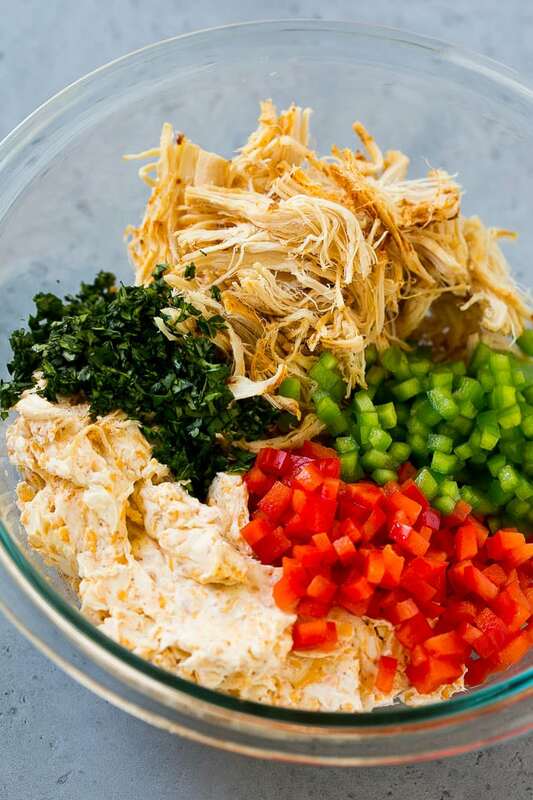 No need to get all fancy and go out of your way to prepare the shredded chicken from start to finish if you don’t have to. IS BELL PEPPER THE ONLY OPTION FOR MEXICAN PINWHEELS? Bell pepper is often the preferred option. However, I have many friends who don’t like bell pepper even if it’s buried in delicious taco flavoring. I love the bell pepper for the crunch and color but other great options are olives, corn, green onions, or canned green chiles. CAN I USE MY OWN TACO SEASONING? Homemade taco seasoning is absolutely delicious. It’s easy to make and tastes so much better than store bought, in my opinion. So, yes, you can definitely use your own taco seasoning and I even encourage it for these taco pinwheels. You can find a homemade taco seasoning recipe here. I like making these Mexican pinwheels mainly when I have leftover chicken I don’t want to go to waste. However, they’re easy and quick to make even if the chicken isn’t already on hand. They always go over well at parties and I’m sure I’ll be making plenty more over the summer. I serve my pinwheels with a side of guacamole for dipping. This is optional, but the flavor of the avocado goes so well with these sandwiches. You could also serve them with a side of salsa if you prefer, or simply as-is! guacamole or salsa for serving. 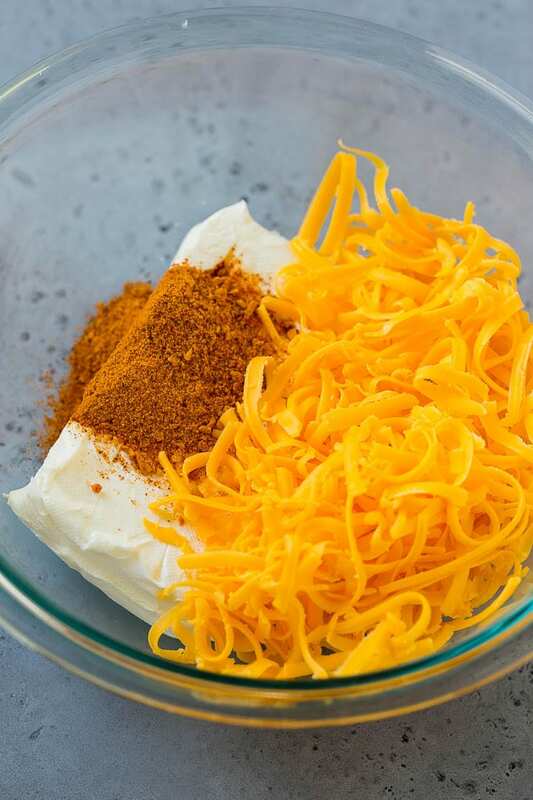 In a large bowl, mix together the cream cheese, taco seasoning and cheddar cheese until well combined. Add the chicken, bell peppers and cilantro into the cream cheese mixture and stir until combined. Lay one of the tortillas flat on a cutting board and spread approximately 1/3 cup of the chicken mixture all over the tortilla. Repeat the process with the remaining tortillas. Place the tortilla rolls on a plate and cover with plastic wrap. Chill for at least one hour or up to one day. 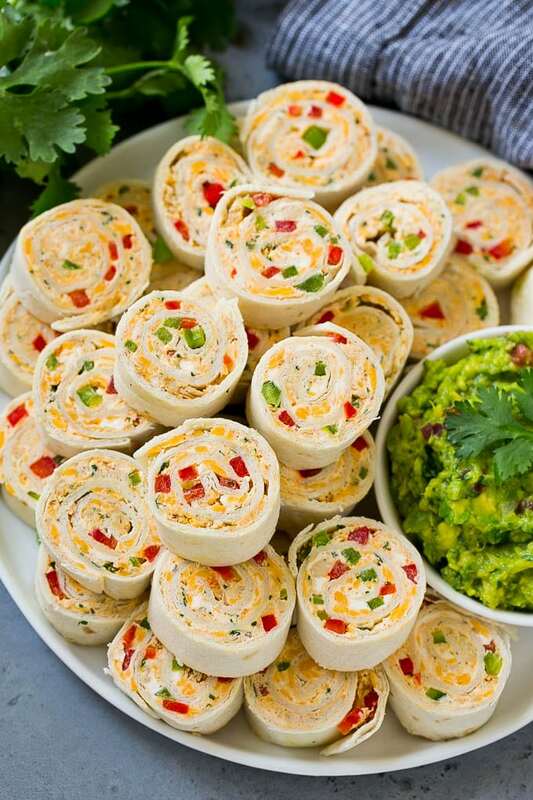 Slice the tortilla rolls into 1 inch pinwheels and serve, with guacamole or salsa for dipping if desired. These look delicious. One thing, In your directions you say to use 1/3 of the mixture but we are using 6 tortillas. Is this correct? It’s 1/3 cup not 1/3 of the mixture! I want to subscribe to your recipes. Thank you. Can you make them with ground beef ? Yes that will work, just use lean ground beef! 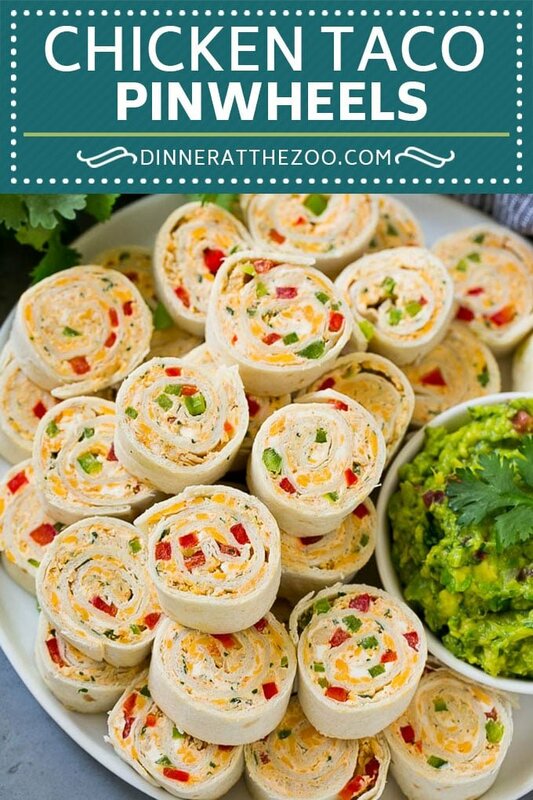 These taco pinwheels look so good and I seem to always have left over chicken. Everything goes better with avacado! Taco pinwheels are a great idea. I love tacos and these look so yummy. Your recips are great! OMG! this recipe looks absolutely fantastic! I love tacos and this is such a good idea! i will try it for sure! What an awesome recipe! These are probably my new favorite thing! I would live off of these! I love the ingredients you used too! These look delicious Sara! Way better than the kind you get at Wal Mart. I love taco pinwheels! I prefer bell peppers in mine too. Your website is my new favorite place to get dinner recipes!